When a jazz singer revisits a standard that has been tackled time and again, it is quite the task to express their musical personality without having to alter the integrity of the original. The experienced jazz vocalist should set the tone for his or her self and their accompanists to create a colorful musical canvas for their audiences. As one who has successfully transformed standards into new gems during her short recording career, Gail Pettis recognizes the power of time-tested lyrics. And her musicality equally matches her interpretative skills. Her finely tuned instrument swings with shear ease, caresses the senses, produces soulful gusts and oozes the blues; all sans the excess vocal gymnastics and fanfare. Besides all those gifts, Pettis never forsakes her musicians in the process, which in the long run makes another lasting imprint when singing jazz, pop and blues classics. Not bad for someone who did not pursue a professional music career at an early age. Considering Pettis’ short time as a full-time jazz stylist, she has won critical acclaim and plenty of fans throughout various festivals in Japan and the Netherlands. This well-traveled talent has also won the hearts of audiences in her current hometown of Seattle, WA. In fact, she records on the Seattle-based Origin Records, which was recognized by JazzWeek – an online site tracking the best in all of jazz music – as Record Label of the Year in 2009 (the other nominees included some of jazz’s top independents: Heads Up! and Sunnyside Records. Even though Pettis was a ‘late bloomer’ in the industry, she was born into some musical blood. Her grandfather – blues singer Arthur Pettis – recorded a few sessions in the late twenties and early thirties. Pettis and her sister partook in classical and gospel music. Eventually Gail followed in her immediate family’s non-musical footsteps. After finally closing her orthodontics practice in 2006, Pettis now spends full time investing in her love and respect for the standards; first with her debut May I Come In (2007) and now her latest disc, Here in the Moment. And there are many moments that even non-jazz loyalists might find attractive from this gentle, yet persuasive alto. The opening track, “In the Still of the Night” (usually heard in doo-wop or in ballad format) and “Day In Day Out” is executed in full swing mode. The strains of the pop and jazz classic, “Canadian Sunset,” thanks to bassist Anderson’s foundation, accentuates the beauty of “The Very Thought of You.” There is Latin flair with “Nature Boy,” as Pettis’ voice runs circles underneath the samba rhythm, and “I Could Have Danced All Night” is injected by drummer/percussionist Mark Ivester’s lively conga rhythms. The later track brought back some memories for me; specifically Peggy Lee’s tribute to Broadway music hyped with Afro-Cuban beats: Latin ala Lee! (1959) on Capitol Records. Pettis sprinkles soft blues nuances on a jazzier angle of the Etta James’ R&B hit, “At Last,” “How Did He Look?” demonstrates Pettis’ ability to understate but still convey heavy emotions towards a lost love. Petti also treats us to duets with Anderson’s in-the-pocket bass on “Snap Your Fingers” and Halberstadt’s sensitive piano gracing the exquisite, “I Thought About You.” ThroughoutHere in the Moment, the two piano (Darin Clendenin & Randy Halberstadt)/acoustic bass (Clipper Anderson & Jeff Johnson) tandems backing Pettis are deservedly given ample room to develop their solo voices. 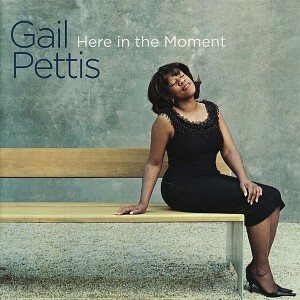 No matter what the mood dictates, Here in the Moment proves Pettis’ calm but articulate style speaks plenty of volumes. She is also quite comfortable in reinterpreting the standards repertoire; an art form in which Pettis truly excels.